We often hear parents say, “My child has not lost all of (his or her) baby teeth, but my dentist wants me to come for an evaluation for braces.” There are various reasons why your child may need braces at an early age. Dr. Kragor putting braces on a patient. Photo used with permission. The American Association of Orthodontists recommends children get a checkup by an orthodontist at the first recognition of the existence of an orthodontic problem, but no later than age 7. By this age, your child has enough adult teeth for an orthodontist to determine whether an orthodontic problem exists or is developing. The orthodontist also will be able to take an X-ray to evaluate the development of unerupted teeth, and the harboring bones and jaws. Dentists are trained to evaluate the teeth and bite, and sometimes things may not look quite right to them and they may refer you to an orthodontist. An orthodontist is a dentist who has undergone advanced specialty training in the field of orthodontics. They are specialized to assess the bite and supporting bones and facial structures, to create proper occlusal form and function, as well as help create a beautiful smile. Signs that your child’s bite is not right can be: early or late loss of baby teeth, habits such as thumb or finger sucking, mouth breathing, difficulty chewing or biting, flared front teeth, an underbite (a bulldog’s bite), teeth in front and behind other teeth (crossbite), a narrow top arch and severe crowding. Any of these issues, a combination of them, or even emotional reasons such as teasing at school due to their teeth, can be a reason for early orthodontic treatment. 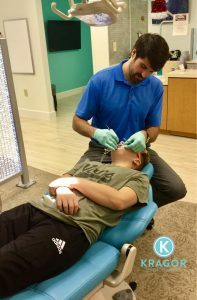 Many orthodontists offer complimentary, no-obligation consultations that allow your child to have an evaluation to determine if any problems exist. Do not fret, however, if your child was not seen by an orthodontist by the age of 7. It is not too late. In fact, it is never too late for orthodontic treatment. Many parents do not seek orthodontic treatment until their child is 12 or 13 (sometimes older), and there is still time for intervention to be done. A majority of children do not need early treatment – many children who are evaluated have perfectly straight teeth. However, if you are concerned, it is never too late (or too early) to have your child evaluated by an orthodontist.